I'm in a group show called Hello, Summer! at Elliott Fouts Gallery, June 4 - July 1. It includes many new paintings of Santa Cruz, surfboards, VW vans, beach volleyball and all things summer. 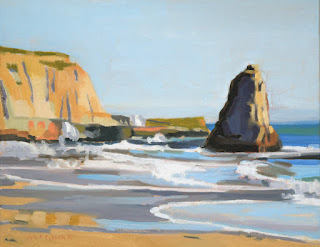 The oil painting "Davenport Beach at Sunset" is in the show. The cliffs at Davenport are some of the most spectacular rock formations north of Santa Cruz and nothing warms up a scene like the light at sunset. Stop by the gallery to see the group show.